Lyndon Engineering are going through some workshop changes to better utilise our internal & external space for larger truck deck and structural steel jobs, along with improving workflow for our agricultural products. The team from Southern Cranes were on hand to help out with moving some our larger equipment. 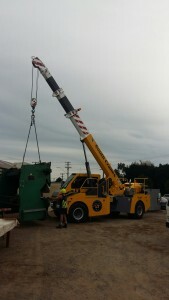 A nice job done very safely by Southern Cranes, great job to all those involved! How do I promote pasture growth for a dairy farm as cheaply as possible, and how do I minimise dairy farm costs in other ways?